Plot: American Senator Gary Hart's presidential campaign in 1988 is derailed when he's caught in a scandalous love affair. Starring: Hugh Jackman, Vera Farmiga, J.K. Simmons, Mark OBrien. 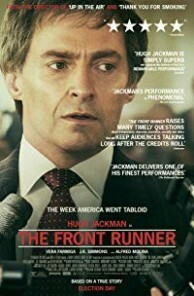 distributed by Sony / Columbia «The Front Runner» in the US movie theaters released on November 6, 2018 and has grossed over $2 million worldwide; dvd and blu-ray release date was set for February 12, 2019. Rent from Netflix and Redbox from February 12, 2019. «The Front Runner» in the UK has no theatrical release date. DVD and blu-ray release date scheduled for May 20, 2019.